laughter responsive and laughter non-responsive. In responsive mode, the robot detects laughter using a multimodal real-time laughter detection module and invokes laughter as a backchannel to users accordingly. In non-responsive mode, robot has no utilization of detection, thus provides no feedback. 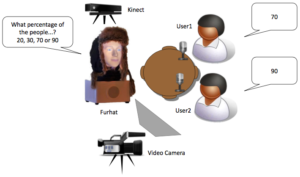 In the experimental design, we use a straightforward question-answer based interaction scenario using a back-projected robot head. We evaluate the interactions with objective and subjective measurements of engagement and user experience. Authors: B. B. Türker, Z. Buçinca, E. Erzin, Y. Yemez, and M. T. Sezgin.